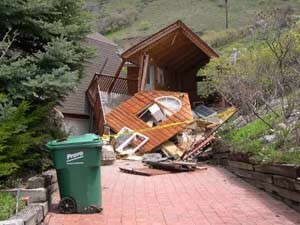 At around 5:00 p.m. on May 12, 2005, a rock fall impacted and destroyed a guest house at 1468 North 1550 East in Provo. Luckily, no one was home at the time. 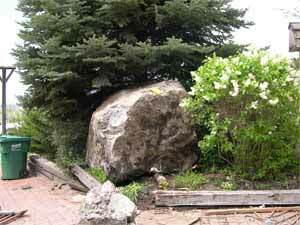 The rock impacted the southwest corner of the guest house and came to rest against a conifer tree in the front yard. The structure is likely a total loss. The rock measures approximately 7×5.1×4.5 feet and weighs approximately 13 tons. Many other fresh rocks from the same fall were also present in the area, indicating that either multiple rocks were involved in the rock fall or the main rock broke up during its fall down the slope. The rock fall occurred shortly after a significant storm on May 10-12 that dropped a total of 3.7 inches of mixed rain and snow at the Cascade Mountain Snotel site, which is 3 miles southeast of the starting zone. It was raining lightly at the time of the rock fall. 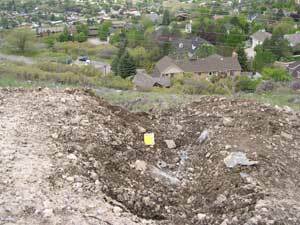 Impact craters (bounce marks) were evident on the 20 degree slope above the house. 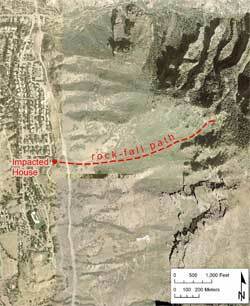 The source was a cliff band in the Mississippian Deseret Limestone on “Y” Mountain about 2,600 feet above the house. The rock(s) traveled a total slope distance of over a mile (about 5,500 feet) and probably achieved high velocity and bounce height as it traveled down the slope. The rock was bouncing just above the guest house and had almost stopped when it rolled into the house foundation wall. The average slope from the rock-fall source to the rock’s resting place is about 28.5 degrees. 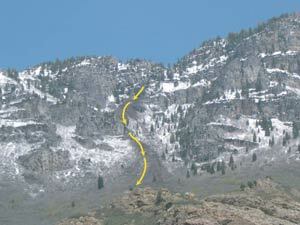 The lower slope is mostly colluvium (material that fell or was washed onto the slope) and the upper slope below the cliff band is talus (rock debris derived from former rock falls). The source area for this rock fall is one of the upper cliffs, but plentiful source-area cliffs extend throughout the area to the top of the ridge above. Abundant rock-fall litter among the homes in the area indicates a relatively high rock-fall hazard. Although the occurrence of this rock fall does not necessarily indicate a heightened rock-fall hazard above what normally exits under present conditions, rock falls are possible in this area at any time and typically occur with no warning, often during and following storms, periods of snowmelt, and earthquakes. This report is preliminary (05/17/05) and subject to revision; it is presented here to facilitate a timely release of pertinent information.